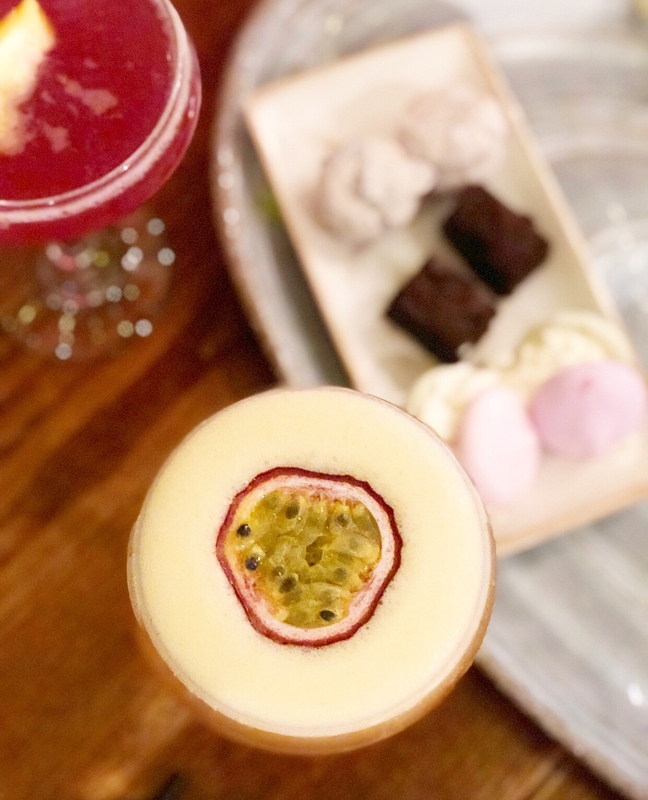 Last Saturday I headed over to the newly opened Slug & Lettuce Old Christchurch Road in Bournemouth to sample their Cocktails and Cake afternoon tea. I have sampled a few afternoon teas over the past few months, so I was quite intrigued to try their tipsy take on the British classic. I also got to take along my mum, which was lovely as we don’t see each other as often since she got a new job. With Mother’s Day coming up, it would be the perfect treat to share together. We were shown to a booth which had been reserved for us and a member of staff explained that the Cocktails and Cake afternoon tea menu included two cocktails each. The cocktails didn’t have to be the same so I went for a Pornstar Martini (my favourite) and a Cosmopolitan. My mum was driving so opted to have orange juice instead, but it was also possible to have a non-alcoholic mocktail. As well as the Cocktails and Cake, which is priced at £15 per person, there are also two other afternoon tea options available – the classic tea is available for £10 per person and the Tipsy Tea, with 2 glasses of prosecco, is £15 per person. The sandwich, scone and desserts are the same on each menu, with just the accompanying drink changing. Our drinks were brought to the table, followed by the afternoon tea platter. I am used to having it served on a tiered stand, so it was a little different to have the platter. There were six half sandwiches, two large scones and six mini cakes to share between the two of us. I am not sure if it was purposefully done but our sandwich fillings were all vegetarian (Halloumi with lettuce and tomato and cheese and pickle). As my mum doesn’t like cheese, she wasn’t able to have any of the sandwiches, which was a shame. Obviously in hindsight I should have explained about my mum not eating cheese beforehand, but it hadn’t crossed my mind. It wasn’t a huge issue, I gave my mum my scone and had the sandwiches to myself. The cakes were delicious. My mum absolutely loves brownies so I let her have both of those, but I really liked the Macaringues and the cookie crumb profiterole was so moreish, I could have happily eaten another few! After we had finished eating, we had time to sit and chat whilst finishing our drinks. We were there mid-afternoon on a Saturday so there were a fair few people there, but it didn’t feel too busy and we were able to relax and enjoy our drinks. I couldn’t resist posing outside against the angel wings backdrop before we left. It was such a lovely afternoon! Our afternoon tea with cocktails was provided complimentary for the purpose of this review, however all words and images are my own.